Croissant Garland With Persimon Curd. Fancy trying out this Croissant Garland With Persimon Curd recipe today? This lovely Spanish persimon curd is so easy to make, using simple fresh ingredients. For a festive idea, serve for breakfast with lemon icing-drizzled croissants arranged in a star shape – a spectacular treat to share! 1 Remove and discard the leafy tops from the Spanish persimons, then chop the fruit. Put into a saucepan with 250ml water and simmer for 20-25 minutes until soft. Puree with a hand-held stick blender, or in a blender. Cool for 10 minutes. 2 In a large heatproof bowl, whisk the egg yolks and caster sugar until combined, then stir in the persimon puree, melted butter and lemon zest. 3 Set the bowl over a large saucepan of gently simmering water and stir with a wooden spoon until the mixture thickens – this will take 10-20 minutes. The mixture thickens more as it cools. 4 Pour into a sterilized jar and seal with the lid. Cool, then refrigerate and use within a week. 5 To serve, arrange the croissants in a circle, with a bowl of the persimon curd in the centre. Mix the icing sugar and lemon juice to make a thin icing. Drizzle over the croissants and decorate with glace cherries and rosemary sprigs dusted with icing sugar. Serve with slices of Spanish persimon. Cook’s Tip: Serve the curd with warm scones, toast or soda bread for a yummy treat. 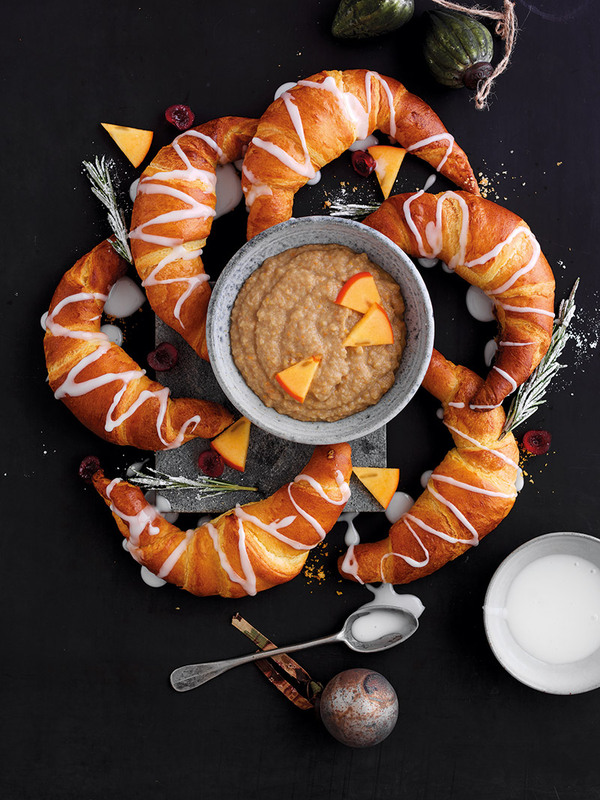 What do you think of this Croissant Garland With Persimon Curd recipe? Let me know in the comments below if you get to make this recipe. 13 Spanish Persimon Recipes: In Season Now. "Half Term, Shopping And Walkies"
"9 Recipes For Mincemeat Day: Christmas Baking"
What a neat treat! :)I would love for you to share this with my Facebook Group for recipes, crafts, tips, and tricks: https://www.facebook.com/groups/pluckyrecipescraftstips/ Thanks for joining Cooking and Crafting with J & J! Looks so lovely. I could just eat some.